W e just finished updating some of our Kidney Check materials to make sure the message that kids should have their kidneys checked is front and centre. 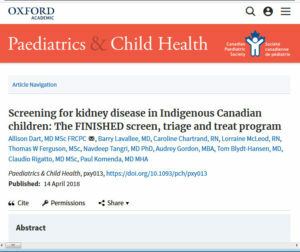 Members of our team just had their work published in this article which points out that of all the kids screened during the FINISHED project, about 15 per cent showed some signs of kidney problems beginning to develop. This highlights the importance of checking kids’ kidney health to find and treat problems early on. Make sure to read the article to learn more.